Classic risk measures (such as volatility) do not consider the path followed by returns and fail to communicate the risk of potential large drawdowns. Using path-dependent measures adds valuable information to any investment decision. We propose a new measure of portfolio risk, the serenity ratio, which estimates both the average and extreme risks carried by an investment. This indicator can be used in a modified version of modern portfolio theory and might assist investors in making prudent investment decisions. Annualized standard deviation or volatility (the Sharpe ratio being its return-adjusted version) is one of the most widely used measures of the riskiness of an investment. As a reminder, Sharpe ratio = (R-R_f)/Vol. The volatility and Sharpe ratio measures present drawbacks of which investors might not be aware. Both upside and downside changes in prices are used to calculate the volatility of an investment. Thus, many investors use a modified version of standard deviation that only penalizes the downside risk: downside volatility (the Sortino ratio being its return-adjusted version). Although an improvement, this downside risk measure can be misleading when it comes to fat tail distributions as it does not focus on tail losses and therefore may significantly understate the range of potential losses. Neither of the above measures consider autocorrelation of returns (i.e., today's return is dependent on yesterday's return). The return series of the MSCI World index sorted to minimize the drawdowns — biggest drawdown, followed by biggest runup, followed by second biggest drawdown, followed by second biggest runup, etc. 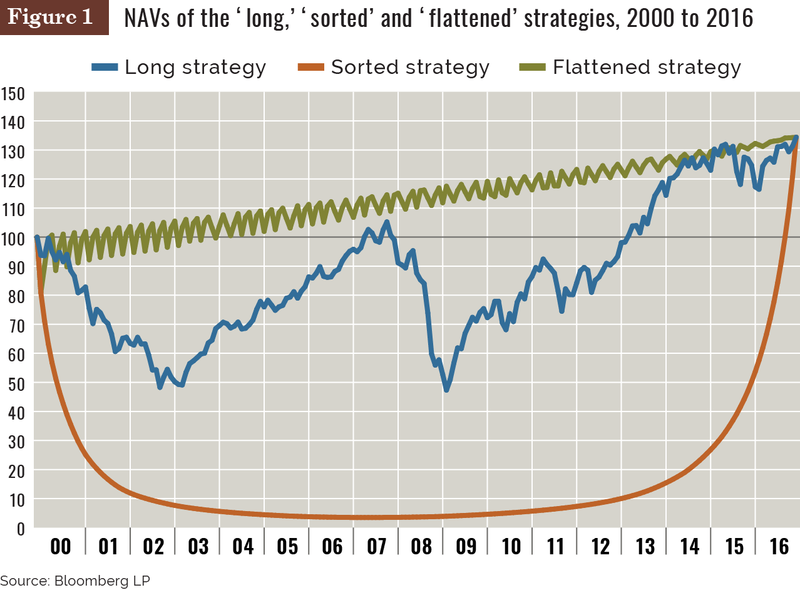 (the “flattened” strategy, blue line). These three strategies offer identical annualized return, volatility, downside volatility, value at risk and conditional VaR figures over the full horizon. Thus, without seeing the path of returns and only viewing the classic risk-return metrics, an investor might risk choosing the sorted strategy, which exhibits much bigger drawdowns than the flattened or long strategies. The serenity ratio is a risk measure that makes a direct comparison between strategies and has a similar construction as the Sharpe ratio. It compares the return of a strategy with a new measure of risk that consists of the average risk of drawdown (through the ulcer ratio developed by Peter Martin) and a penalty factor measuring the risk of extreme drawdowns (called the pitfall indicator). The higher the serenity ratio, the more serene an investor will be regarding the investment, hence the name. As an example, the following table compares the standard Sharpe ratio and the serenity ratio for the chart presented above. The serenity ratio highlights the most appealing strategy having the lowest drawdowns and being closest to a straight upward-sloping line. This measure is very useful when comparing different investment strategies (together with the standard Sharpe ratio) to gauge the quality of each strategy regarding returns, volatility and drawdowns. The serenity ratio is a measure of the drawdown risk of a strategy on an ex-post basis (it works best looking in the rear-view mirror). The serenity ratio provides relevant information if heavy drawdowns have been observed and/or when there is sufficient historical data to be representative of the behavior of a strategy through different market cycles. Since investors are looking forward, we solved the backward-looking bias of the serenity ratio by coming up with an ex-ante measure: The smart Sharpe ratio. The original Sharpe ratio includes an autocorrelation factor. However, most investors calculate an adjusted version of the Sharpe ratio (“traditional Sharpe ratio”) that excludes the autocorrelation effect. By annualizing the volatility, the autocorrelation effect is ignored. Thus, investors underestimate the inherent risk of path-dependency (one loss is followed by another loss, etc.) and results in a traditional Sharpe ratio with a bigger hidden risk of drawdowns. The smart Sharpe ratio considers the path dependency by reinstating the autocorrelation of returns. By maximizing the smart Sharpe ratio, investors can further minimize drawdowns and therefore maximize their serenity ratio. 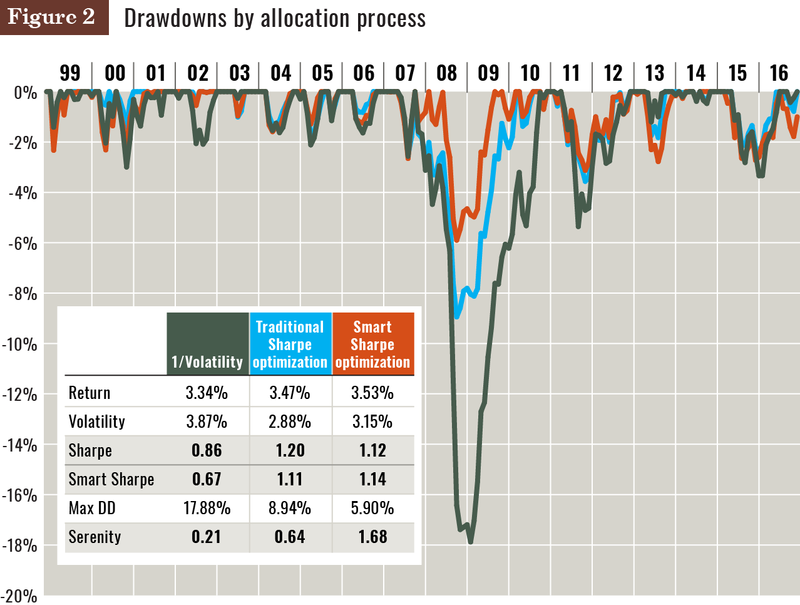 The following example compares the underwater curves (i.e., the drawdowns) of different allocation processes: a standard risk parity allocation (1/volatility allocation), a traditional Sharpe ratio optimization and a smart Sharpe ratio optimization. The smart Sharpe optimization reduces the maximum drawdown (Max DD) by more than 35% (to 5.9% from 8.94%) and results in a serenity ratio nearly three times higher vs. the traditional Sharpe optimization (to 1.68 from 0.64) while maintaining a similar Sharpe ratio (1.11 vs. 1.14). By reintroducing the notion of path dependency, the serenity ratio assists investors to better evaluate the hidden risk of drawdowns and to improve their allocation process. Robert Baguenault de Viéville and Raphaël Gelrubin are founding partners and fund managers, and Edouard Lindet is a research analyst, at KeyQuant SAS, Paris. This content is derived from two white papers by the authors. It was submitted and edited under P&I guidelines, but is not a product of P&I's editorial team.